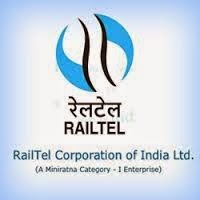 RailTel Corporation of India Limited is a Mini- Ratna (Category-I) Public Sector Undertaking under Government of India. It is the largest Neutral Telecom Infrastructure of India with a strong footprint in diverse fields of OFC based SDH and IP networks, Tower Co location, Retail Broadband (RailWire), Data Centre, Telepresence and many more. With a huge network of Optic Fiber Cable spread across the length and breadth of the country, RailTel endeavors to bridge the digital divide of India. RailTel takes pride in being part of the Govt of India’s path breaking projects - National Knowledge Network (NKN), National Optical Fiber Network (NOFN), and many other strategic projects. RailTel has a sharp focus on enabling India’s Knowledge Economy. 2. Deputy Manager(Technical):i) BE/B.Tech in Electronics & Telecommunication; AND ii) Having qualified GATE - 2014 in EC paper. Application Fee : Applicants shall have to pay the application processing fee of Rs. 1000/- (Rs. 500/- in case of SC/ST/PH). The fee will be collected through payment gateway only during the on-line registration process. Any processing charges towards the same plus service tax, if any, will have to be borne by the applicant. RailTel will not be responsible in case of broken transaction during online payment process. It is the responsibility of applicant to ensure that payment has been made successfully. Fee through any other mode of payment, like demand draft, pay order, cheque, postal orders or challan will not be accepted.